Contemporary Craftsman! 3 Bed, 2 Bath home with Loft-style Family Room has approximately 2418 square feet built in 2006. Meticulously thought-out lakefront home with stunning views from energy efficient windows has a bright, light-filled interior. Features gorgeous solid red oak doors, trim and custom built-ins for that timeless Craftsman quality and unsurpassed style. So much personality from the moment you drive up, with all the upgraded fixtures and finishes you'd expect from a home designed with a passion for every detail. Enjoy indoor/outdoor living with surround sound throughout the interior and also in the backyard. Meandering stone paths through the lakeside garden down to your own shaded stone terrace invite you to relax after a long day and enjoy stunning sunsets over the lake. Add in plenty of storage under the back deck for all of your lake toys, three pantries and a detached garage for a place that you'll long to come home to! 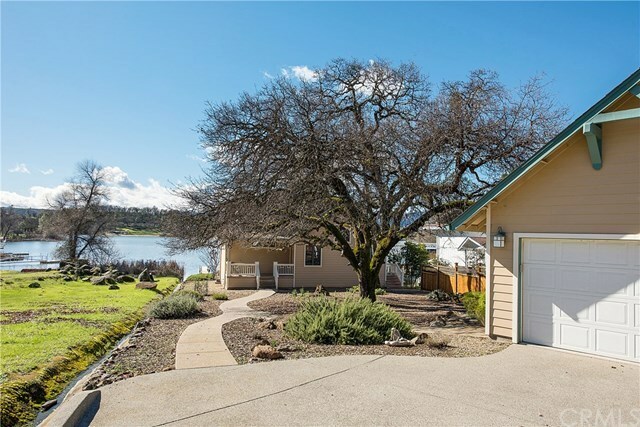 Hidden Valley Lake subdivision amenities include: Beautiful private swimming lake recently stocked for fishing, Olympic sized pool, eighteen hole championship golf course, horse stables, dog park, tennis courts, restaurant and lounge, nearby schools, shopping and so much more! Just 20 miles from Calistoga and Northern Californiaâs lovely Napa Wine Country and 40 miles from Santa Rosa. Take day trips to different lakes, drive Silverado Trail, visit local wineries; so much to enjoy, visit and do!